Touch of A Rogue was a super nice surprise for me. I don't normally read historical romances, but lately I've been trying to read outside my comfort zone because I've been discovering some really great books! Touch of A Rogue is one of them. Now, I am not in love with it, but I definitely did enjoy it. I think it's the way they speak that sort of throws me off. I am all for watching movies that take place in the old days, but reading a book in that era has never been my cup of tea. 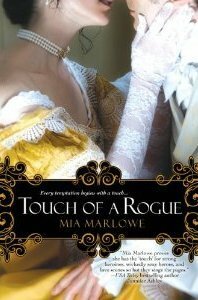 The reason I think I was able to enjoy Marlowe's Touch of A Rogue was because even though their language is hard to keep up with at times, I did feel that it wasn't overwhelming and I was able to follow the story very easily. The story has a great opening. Jacob is a character I easily fell in love with just from the first two pages of the book. He is hilarious! I got sucked into the lives of two VERY funny and strong willed characters. Jacob lives his life freely. He does what he wants, gets what he wants, and just lives life to the fullest. He only deals with married women so this way no one ever gets attached to him. When he meets Lady Julianne the story gets even more interesting and more hilarious. I loved their relationship. Lady Julianne wasn’t intimidated by Jacob and isn’t easily embarrassed by things. Jacob, who is only used to dealing with married women, can’t help himself when he’s around Julianne. There is just something about her that makes his whole body react. Julianne doesn’t care to get to know Jacob. She hears he’s the best at what he does and she really needs his help finding some daggers. They both have secrets that are later on revealed and this was something that also made me enjoy this story a lot more. I would love to have Jacob's gift, but at the same time it would scare me. Even though it has a taste of paranormal in it, it wasn’t too overly done. You get to know the characters and watch them grow while at the same time their story unfolds. I am curious now and would like to read the first book in this series. You really don’t have to read it in order to follow Touch of A Rogue. I wasn’t confused or lost one bit while reading. It can definitely be a standalone. I enjoyed it and I think you will too! A Good Choice for Reading! I'm glad you found Touch of a Rogue, especially if you don't often read historicals ... it will help you come over to this side more often. I loved it, and the touch of paranormal just adds a bit of whimsical intrigue to the characters and story, which is fun for me. Mia Marlowe's characters, both primary and secondary, are the major reason I enjoy her writing -- though her story and setting are always well-drawn, too. As one of her fans, thank you for the well-written review. And I hope you enjoy the others of her books you have waiting for you!